I love a good ‘Y’know what would be really cool?‘ moment. A few years back Mike Davidson had the nifty idea of feeding live snapshots from his Puget Sound harbour view directly into the header of his blog. In essence his blog was saying ‘Dawn or dusk, rain, hail or shine, this is where I am at right at this moment‘ — a very appropriate idea for a blog. Jump forward to 2006 and The Unseen Video by Daniel Scheibel and Ferdinand Weinrother cleverly turns the idea on it’s head by centering it around you, Mr/Ms. User, rather than themselves, Mr/Ms. Designer. At it’s core, ‘The Unseen Video’ is simply a stately, flash-powered music video for Mike Milosh’s ‘You Make Me Feel‘. However, the interesting angle is that any single viewing of the clip is a once-off performance. During the loading process, the application first determines your geolocation via an IP database and then used that information to determine your local time of day and weather. This information is then passed to the Flash which uses it to influence the color palette, ornamentation (flowers, pollen, rain, snow, etc) and the character and mood of the animation. They are always different but the basic animation is always there. 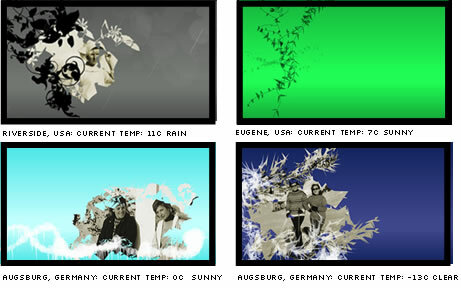 Depending on the weather situation there are additional animations of snow, rain or pollen and clouds. All the visualisations are artistically and graphically composited. Replaying the clip 15 minutes after your first viewing will show subtle differences in the arrangement. Replaying the clip months later will render radical changes from it’s original state. This is an experimental project, but it’s a shame we don’t see this general concept applied to more commercial sites. Perhaps GAP (currently pushing their Spring collection) would graphically emphasize their winter range if they could determined you were viewing their site from a cold climate. Maybe a Caribbean resort might put more emphasis on it’s warm climate when marketing to someone in northern Canada than someone in southern California. It’s not about removing options — the GAP shopper might well be shopping for their Caribbean cruise — but , like any shop window, there is a limit to the number of items you can spotlight at any given time. This kind of approach would have to increase your chances of choosing the right one. There’s a Flickr stream showing results from varying locations which you might even like to contribute to, if you get something interesting.